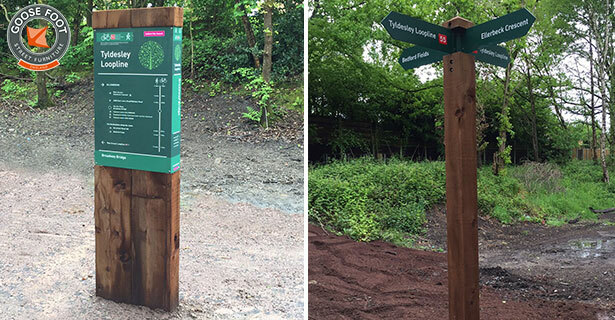 Goose Foot Street Furniture were approached by The Casey Group with designs created by Urban Vision Partnership, to manufacture a series of fingerposts, signage and information hubs for Tyldesley Loopline. Originally a disused railway line, Salford City Council is currently improving the Loopline, which is a 2km long traffic-free cycling and walking route linking the multi-user path along a new guided busway and Roe Green Loopline. Once it has been improved, the path will form part of the network of high quality, traffic-free routes in Salford that have been developed to encourage walking, running and cycling. We manufactured six entry signs, seven fingerposts and four information hubs using a mix of timber (Treated Douglas Fir), and dibond aluminium. All of the signs have an anti-vandal coating to deter the public from defacing them. 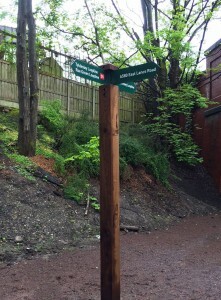 They are located at various junctions and entrances to the Loopline from the adjoining housing estate and surrounding roads to give direction, information and location distances throughout the 2km area. With some of the fingerposts standing at over 2.5 meters above ground and over a meter below ground, the amount of Douglas Fir required meant that the majority of the manufacturing time was the treatment and finishing of the timber. However, from when the final decision on designs was agreed, we were able to complete manufacture and delivery of the whole project within 6 weeks. Gary Henderson, Business Development Executive for Goose Foot Street Furniture said: “We were delighted to be approached by The Casey Group to manufacture the products. Throughout the initial consultation with Casey Group, the designs and requirements changed in order to give the client exactly what they wished the regeneration of the area to achieve. The installation has now been completed by The Casey Group. With more than 30 years’ experience in designing and manufacturing street furniture, Goose Foot is recognised as the ‘go-to’ steel fabricator for urban realm and regeneration projects across the UK. Goose Foot also offer a one hour RIBA accredited CPD Seminar on Bespoke street furniture in regeneration projects. To discuss your requirements for your public realm project, please contact us today.